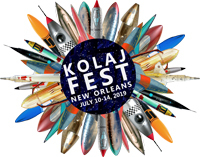 We made some changes to Kolaj, not all of them are aesthetic. 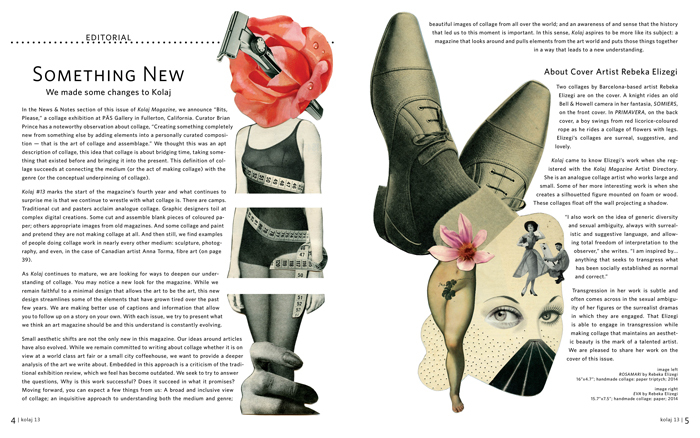 In the News & Notes section of this issue of Kolaj Magazine, we announce “Bits, Please,” a collage exhibition at PÄS Gallery in Fullerton, California. Curator Brian Prince has a noteworthy observation about collage, “Creating something completely new from something else by adding elements into a personally curated composition — that is the art of collage and assemblage.” We thought this was an apt description of collage, this idea that collage is about bridging time, taking something that existed before and bringing it into the present. 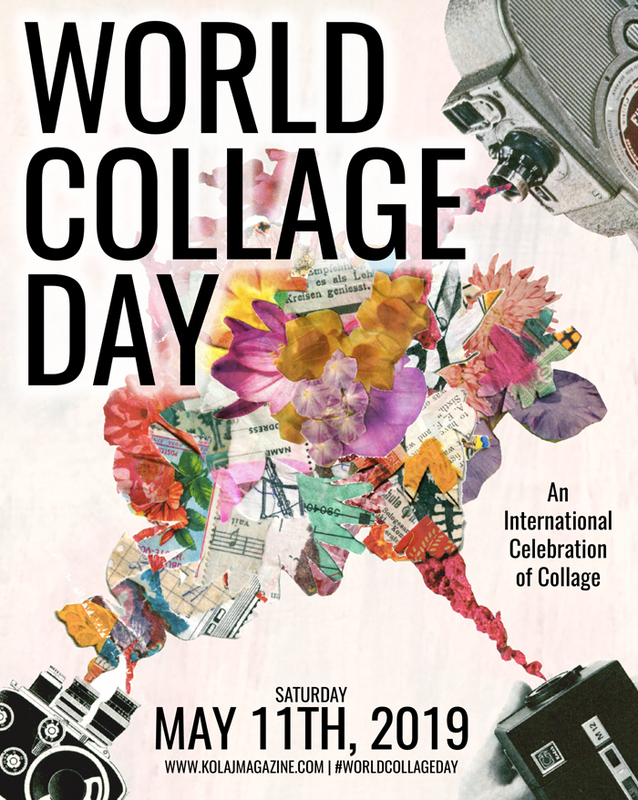 This definition of collage succeeds at connecting the medium (or the act of making collage) with the genre (or the conceptual underpinning of collage). 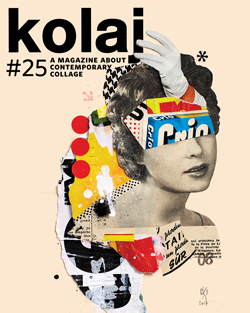 Kolaj #13 marks the start of the magazine’s fourth year and what continues to surprise me is that we continue to wrestle with what collage is. There are camps. Traditional cut and pasters acclaim analogue collage. Graphic designers toil at complex digital creations. Some cut and assemble blank pieces of coloured paper; others appropriate images from old magazines. And some collage and paint and pretend they are not making collage at all. And then still, we find examples of people doing collage work in nearly every other medium: sculpture, photography, and even, in the case of Canadian artist Anna Torma, fibre art. As Kolaj continues to mature, we are looking for ways to deepen our understanding of collage. You may notice a new look for the magazine. While we remain faithful to a minimal design that allows the art to be the art, this new design streamlines some of the elements that have grown tired over the past few years. We are making better use of captions and information that allow you to follow up on a story on your own. With each issue, we try to present what we think an art magazine should be and this understand is constantly evolving. Small aesthetic shifts are not the only new in this magazine. Our ideas around articles have also evolved. While we remain committed to writing about collage whether it is on view at a world class art fair or a small city coffeehouse, we want to provide a deeper analysis of the art we write about. Embedded in this approach is a criticism of the traditional exhibition review, which we feel has become outdated. We seek to try to answer the questions, Why is this work successful? Does it succeed in what it promises? Moving forward, you can expect a few things from us: A broad and inclusive view of collage; an inquisitive approach to understanding both the medium and genre; beautiful images of collage from all over the world; and an awareness of and sense that the history that led us to this moment is important. In this sense, Kolaj aspires to be more like its subject: a magazine that looks around and pulls elements from the art world and puts those things together in a way that leads to a new understanding.